I have declared this week Zero Waste Week, and I am attempting to generate no waste at home. This means NO landfill rubbish and NO recycling (in case you’re wondering why no recycling, I wrote this post explaining why recycling isn’t the green solution we’re led to believe). So at the weekend I dusted off the bokashi bin that was donated to me by a friend rather more months ago than I’d like to admit, on the condition that I blogged about it. Better late than never! 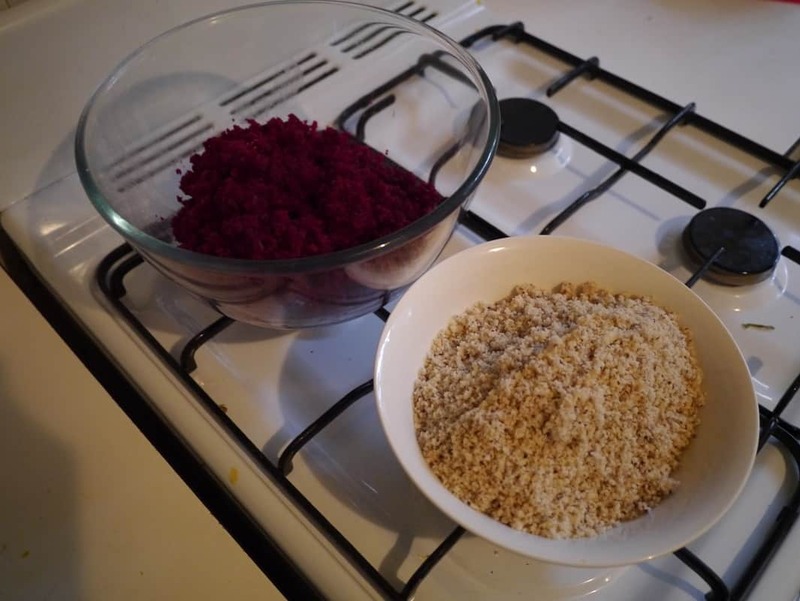 Most of my food scraps go to my worm farm, but lemon peel, onion skins, eggshells and other bulky fruit and veg waste usually go in the bin (the worm farm is pretty small) – and I lament not being able to compost. Bokashi bin installed in the kitchen. 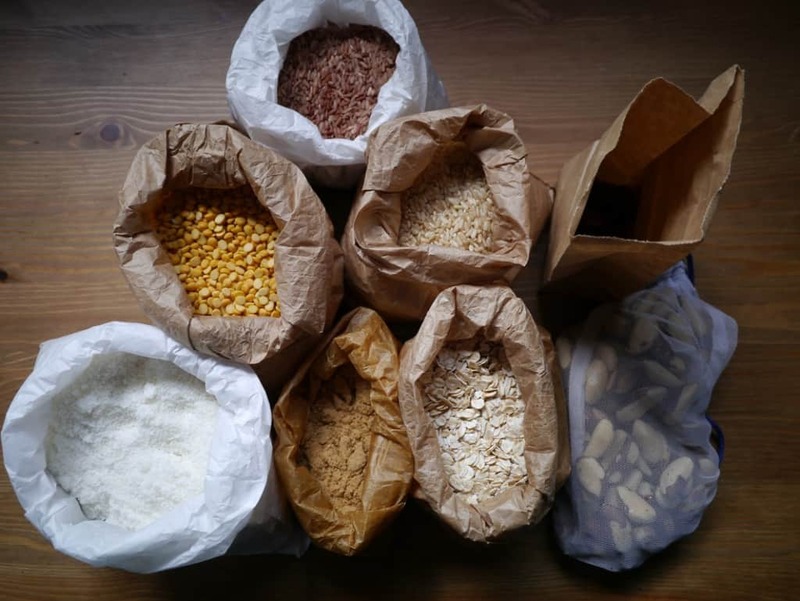 The donated bokashi mix comes in plastic – if this is something I want to keep up with, I’m going to have to learn how to make my own! Not any more! Or at least, not this week. 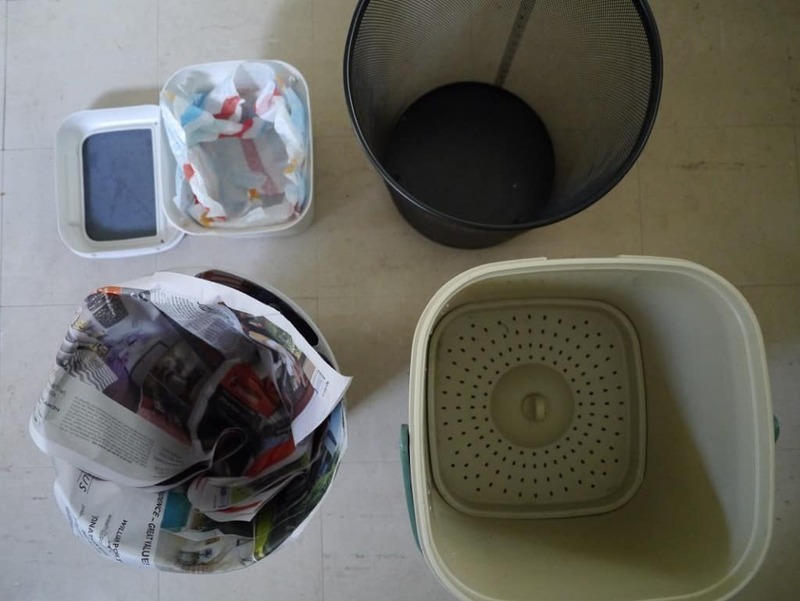 I’m going to give the bokashi bin a go (I will write a blog about it once I’ve used it for a while and can offer some wisdom!) and see how that works out for me. The black metal bin is for recycling. 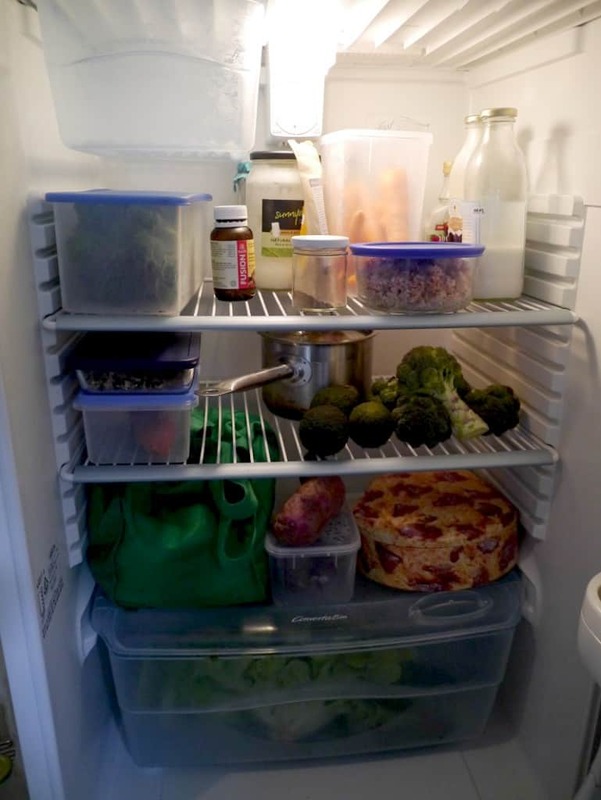 The paper-lined bin is for food waste – I lined it out of habit. We use the community newspaper to line once it’s been read. If it doesn’t need changing, then it doesn’t count as waste! The small caddy is scraps for the worm farm, and lined with Who Gives A Crap? toilet paper wrappers (read about that here). The bokashi bin is the shiny new addition to the line-up. Our vegetable box was delivered last Thursday (we currently get one large box a fortnight) so there’s still some fruit and left. The saucepan contains soup, the tin contains a cake and the glass Pyrex containers hold leftovers. The milk bottles actually contain cashew milk which I made on Monday morning (the recipe is here). Note: yes, some of my veggies are in plastic containers! Slowly but surely I’m replacing them with glass and stainless steel, but sometimes I still have to use the plastic ones. I never use them for leftovers, only raw veg that will be washed, peeled and cooked. I can’t really take a picture of our pantry as we no longer have one since the move! At some point we will get something, but for now half of my jars are living in a storage crate, which doesn’t make for good photos. The pantry did need some restocking though, so yesterday morning I headed to Fremantle. Before shopping I met a friend for coffee (dine-in of course! ); fortunately the shop only print receipts on request so I was still waste free. I headed to a different shop to pick up some things – using my own bags. They didn’t print receipts unless requested either. 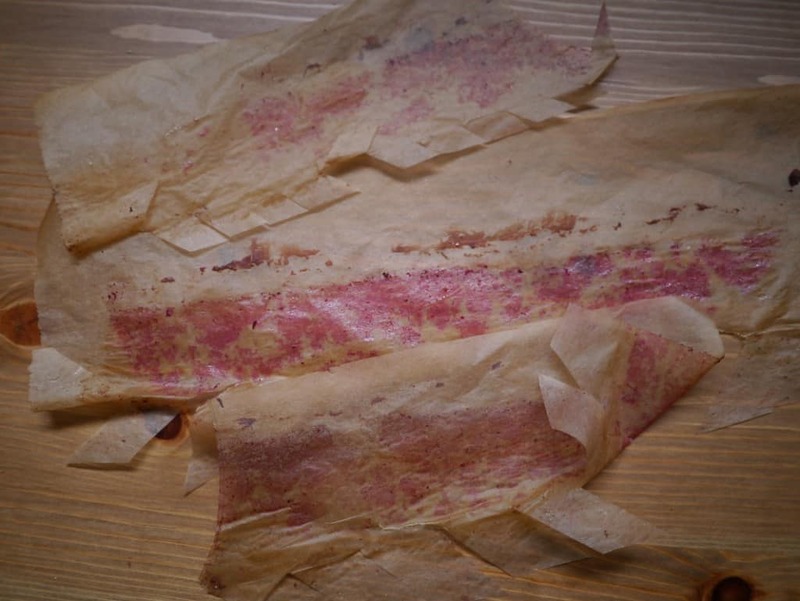 I reused paper bags that I brought from home: I’m reusing until they disintegrate/get stained/turn gross, and then they will go to the worm farm. Once home, these get stored in glass jars…except the brazil nuts and coconut, which got turned into cake. I used greaseproof paper to line the tin (I don’t always, but for this cake it’s necessary). I tend to clean my paper and reuse it if I can (as much because I’m too lazy to cut new circle shapes every time); usually I only get a couple of uses and this was the second go. If I can’t salvage the paper, it will go to the worms. I needed to go to the Post Office to send two parcels, and for this I received a receipt. My dilemma is this: it’s a thermal till receipt (you can tell because it’s slightly shiny and sort-of slippery) and thermal till receipts are coated with BPA. I’ve talked about why BPA is bad before, and it’s often recommended that we don’t recycle thermal till paper as it ends up as toilet paper, food packaging or even napkins, and these become contaminated with BPA. Some people argue that because it is such a small amount it doesn’t contaminate the waste stream significantly. I have to confess, I currently recycle my receipts. But put them in the worm farm? Hmhm…I’m not sure I want to do that. So whether it goes to landfill or to recycling, it’s still in the waste pile. I think I need to get into the habit of refusing receipts, and leaving them in the shop! It feels good getting the bokashi bin going. I hate throwing all that food waste in the bin, especially as it’s mostly organic and I’ve heard that organic waste makes better compost! My default action is definitely to go for the bin! When I sweep the floor, or wipe food from the counters I head for the bin rather than the worm farm,and this is making me think twice. I need to start training myself to refuse till receipts. Practice makes perfect! We definitely have far too much paper in our house. I have a feeling that the worm farm is going to struggle with the extra waste (particularly cardboard) and I’m going to have a think about whether I can steathily install a compost bin in the lawn area at the front of our building. So far so good! I’m midway through Tuesday and nothing has gone disasterously wrong yet…but will it continue to go swimmingly as the week progresses? 27 Comments • Leave a comment! Oh my, what is that cake? It looks delicious! I don’t want to tell you because you might be scared! It is a raw cake, mostly made of beetroot, coconut and brazil nuts. It keeps amazingly well, tastes great and you don’t need to cook it – stick it in the tin and you’re done! 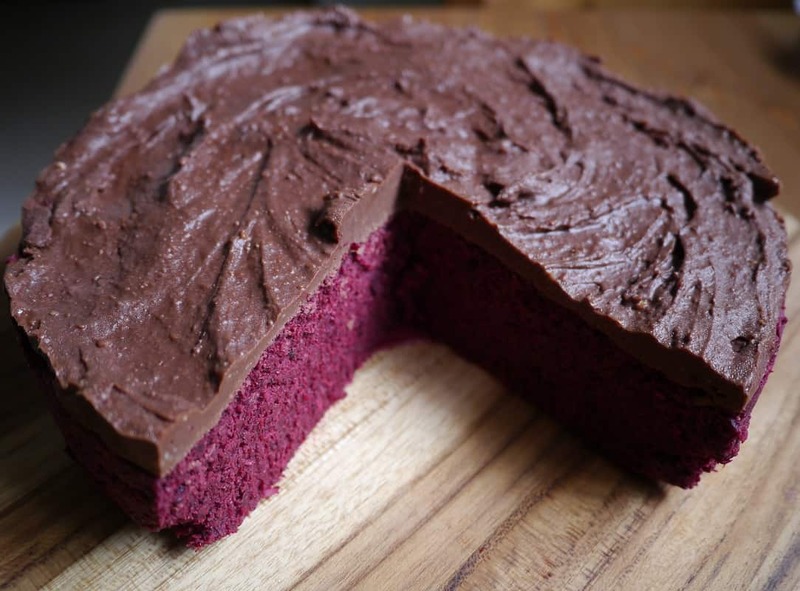 The recipe is here: http://www.drlibby.com/recipes/Beetroot_Chocolate_Mud_Cake I usually half the icing though. There’s always cake Chamali, no matter what the challenge! I’m interested in how your zero waste experiment turns out. I’d be especially interested in how much extra time it takes you to process items instead of tossing them in the trash or recycle bin. I hate getting receipts, but many of the places I buy from will print them even if I don’t want one, and then they throw the extra copy in the trash. I have seen that some stores now offer to email you a receipt instead of printing one. Thanks Eric. That’s a good point about extra time. I guess, from going plastic free, that a lot of my habits are already ingrained, but thinking about how long things take is definitely relevant. Not using plastic (so making most food from scratch) definitely increases the amount of time I spend washing up, for example! Grrr! The emailing of a receipt is a great idea – thing is, if it’s happening in the US now, it’s probably going to take another 20 years to filter over here! How does it work – you have to provide your email address as you buy? Or it’s linked to your card? Sounds intriguing! The ones I’ve used you have to give them your email address when you buy. I worry a little that I might start getting spam emails from the store, but I can usually unsubscribe if that starts happening. Haha, thanks! Yes the cake is delicious! You should definitely make it! Thanks for the inspiration. I’m full of admiration. It’s a tricky situation with the receipts – if you leave them in the store, they’ll probably end up in landfill. I thing that when it comes to receipts if they get printed it might be best to take them home and recycle them. If you leave them at the store they’ll most likely go to the landfill. And even if you didn’t want it in the first place it still is your trash and you are responsible for it. I keep mine and write notes or lists on the back before recycling them. 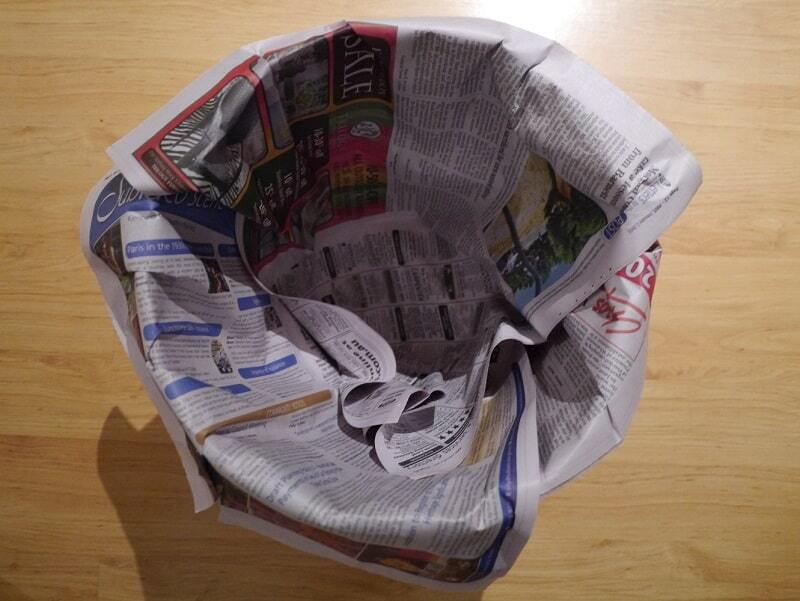 Maybe you could try to recycle your own paper(i’ve read it’s quite easy). That way you can beter control how your paper will get used(as writing paper instead of food packaging or toilet paper). Hi Gaby, I just replied to Elissa in the comments about my theory behind refusing receipts and leaving them in store. Currently I do use them for list-making: I love lists and my desk is covered in random scraps of paper and receipts with scribbled notes! When I was reading about thermal BPA receipts though, lots of articles were saying DON’T TOUCH THEM! Seems to have had an effect on me somehow! Just a thought, if your sneaky compost bin at home doesn’t happen, is there a community garden or primary school nearby that would let you use their compost heap in exchange for helping maintain it? That is such a good point! There is a primary school across the road from me and they have compost bins and worm farms…I’ll have to go investigating! The other issue is when the bokashi bin is full I’m meant to bury it or compost it, and I’m not sure where to bury it so this may work out really well. We have a Bokashi Bucket that I use on-again-off-again. Mainly I get frustrated that when I bury the waste, the dogs dig it up! But it is amazing how much the bucket reduces your volume of household waste. Good luck. I too look forward to haring how you go. Haha, that would be annoying! Thankfully I don’t have that problem. Instead I don’t actually have a garden, so I’m going to have to stealthily bury it in the communal space when no-one is looking! And see how that turns out! The burying issue is what held me back from starting to use it, actually. But no more! It’s fully functional now! Lindsay, I have been refusing receipts and have even asked at the few places I frequent if they have an option not to print one but they don’t. My daughter-in-law works at a dollar store where she must touch these thermal receipts all day long. I suggested she try to fold a section at the top to avoid touching the coated side but she’s probably still getting residue from the back touching the coating on the paper under it while on the roll. As for your composting. I have a simple solution. While I do have a garden you can do the same in a pot. Fill a pot 2/3 up with potting soil then bury your food scraps in it. Keep it damp and your food scraps (minus meat and dairy) will decompose in no time. In warm months most foods decompose in a matter of days. You can then plant right in the pot and have rich soil. No plastic to worry about and there is no smell. That cake looks delicious and your fridge is one of the neatest I’ve ever seen. I hadn’t really given the receipts that much thought, but this challenge definitely brought them to my attention! Why places can’t just print them on request I don’t know – it’s such a waste. I think I’m going to have to focus on refusing them much more than I have been. Now you mention it, when my friend gave me the bokashi bin she also gave me a large pot for burying the scraps. Thing is, I’ve planted a bush in it! Will need to get another one. That is a great idea – I feel selfish about my food waste and don’t want to give it to anyone else! Especially if I then need to go and buy compost! The bokashi bin should help as it reduces the volume of food waste first. Great idea -thanks! Lindsay, it’s crazy the waste, just think how many receipts are printed in a day world wide. A couple of stores have their registers set up so unless the cashier pushed the print button the drawer won’t open. I just refuse them I know they still go in the trash but at least I’m not handling them. I’m with you, I don’t want to share my compost. I have been watching my peas grow. I have them planted in two different beds. The one had more food scraps buried in it and the plants are double the size of the other bed which I didn’t have nearly as much food scrap in it. Lois, we all just need to buy less! I hate popping into the shops for one thing because the receipt is bigger than the thing I pop in for! Yes, I need to refuse them. I have bits of paper all over the flat and we’d be so much tidier if we didn’t bring them home. So I keep my worm farm castings for the day I have a garden!
. Btw, we were there because my daughter-in-law walks every day for her pregnancy and it was too muggy outside. Sorry I’m late to the party – email alert seems a bit slow. I’ve used bokashi, but not lately since my ability to bury it is hard. Alas, I do use the community compost bin, and hardly eat citrus. Meat scraps (which can be Bokashi’d) get frozen til I can get them to my parent’s dog. I also put vacuum fluff in the ‘trash’ as it usually contains some non organic matter… I know what you mean about habits though! Thermal receipts – yep, mine are in landfill. I would refuse, and do, when it’s suitable, but for food and clothes, I like to have them on hand, for record keeping and also should I need a refund etc. To be honest, I assume ALL are BPA laced, when I’m sure some aren’t (like AusPOst… they seems to usually be more ‘papery’ than kmart etc). I feel like them trashing them in store, while sending a message, probably falls on deaf ears… Thoughts? Don’t worry, latecomers are welcome too! : p Just kidding, you’re not late at all! Bokashi seems like a bit of a faff because of needing to dispose of it afterwards. I’m going to try Lois’ idea and get a big pot to bury it in. Hopefully it will take a while to fill up! 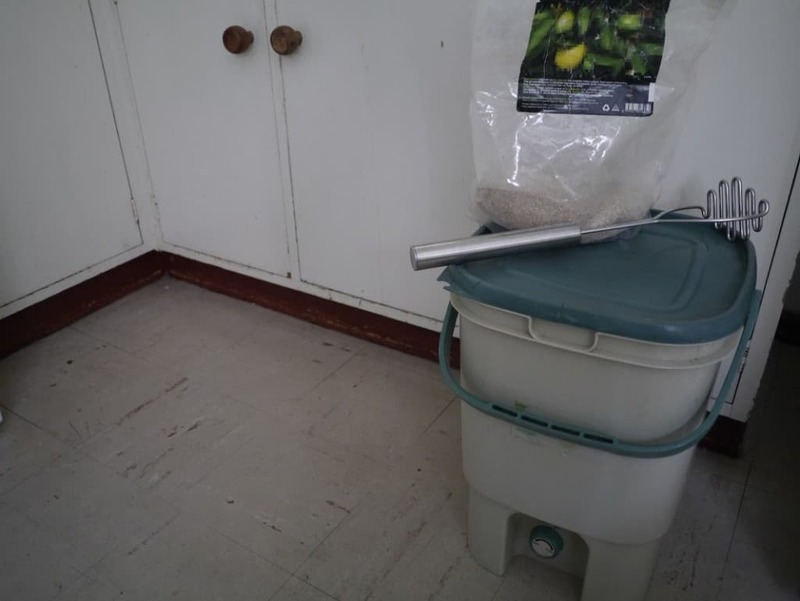 Vacuum fluff – yeah, I know it’s compostable or wormfarm-able, but I’m reluctant to put it in the worm farm because, like you say, it’s got nasty pollutants in it too – we live in a city after all. We usually just empty it behind a tree that lines the driveway! I agree, I think the majority are BPA-covered. AusPost ones definitely are! I think me refusing receipts isn’t a very big gesture, but if more people do it then the message becomes louder. The other thing is, having read up on them before writing this, I’m not sure I really want to be touching/handling them! So leaving them in shop limits my exposure to BPA at least! 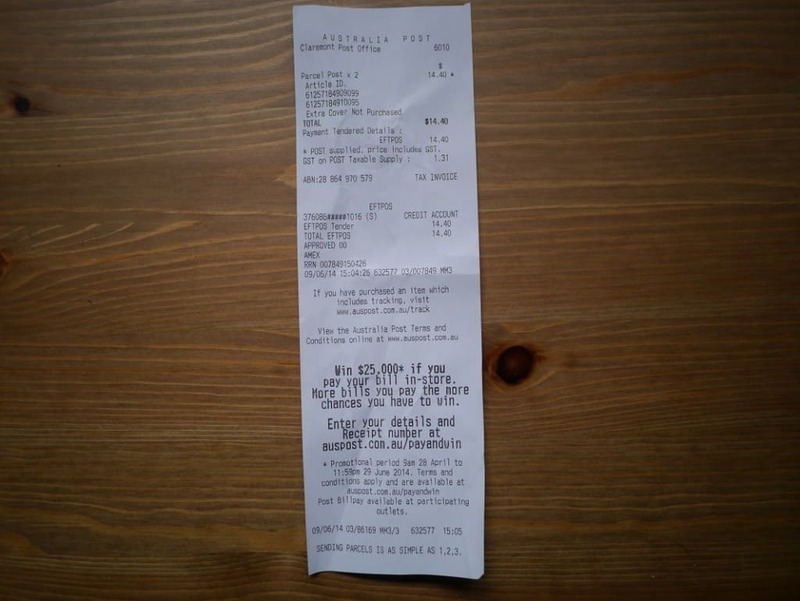 Surely from a cost-cutting perspective it makes sense for stores to rethink handing them out – till receipts cost money. So hopefully this email-receipt idea will catch on and paper receipts will be a thing of the past. In 2012 I accepted a month-long challenge to avoid plastic... and never looked back! Now I live zero waste and plastic-free, and I help others take action to live better with less waste. I'm a writer, speaker and waste-free living advocate, sharing my journey and what I learn along the way. My passion? Sharing skills and ideas; growing community and inspiring others. Doing stuff not buying stuff. Click here to find out more!